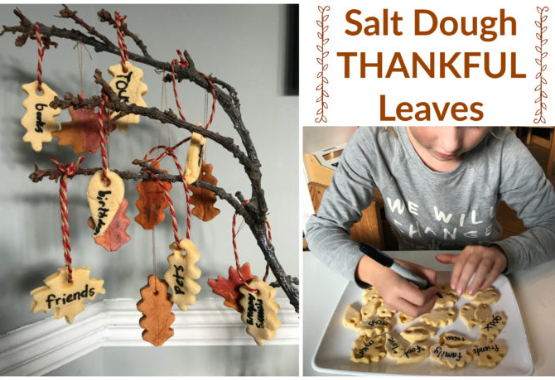 Let's make some Salt Dough Thankful Leaves as a family thankfulness activity to do together! 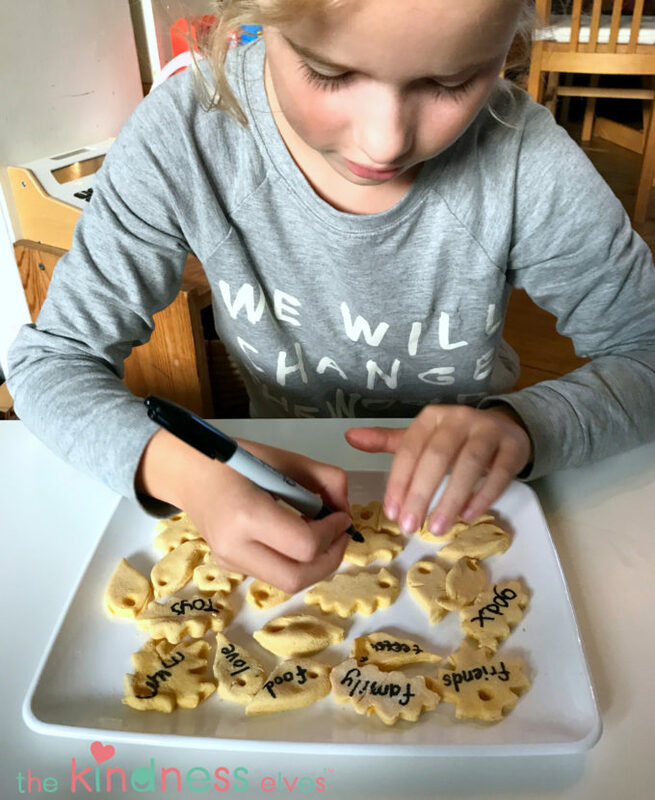 The Kindness Elves often suggest to the children that they should stop and think about all the things in their lives that they should be grateful for. Our happiness really thrives on our thankfulness and it also helps us to see the need of others around us with open eyes. If we are thankful for our constant supply of food and water then we can appreciate how awful it must be to be hungry and thirsty. Developing empathy is one of the central missions of the Kindness Elves, helping to grow kind and caring children. 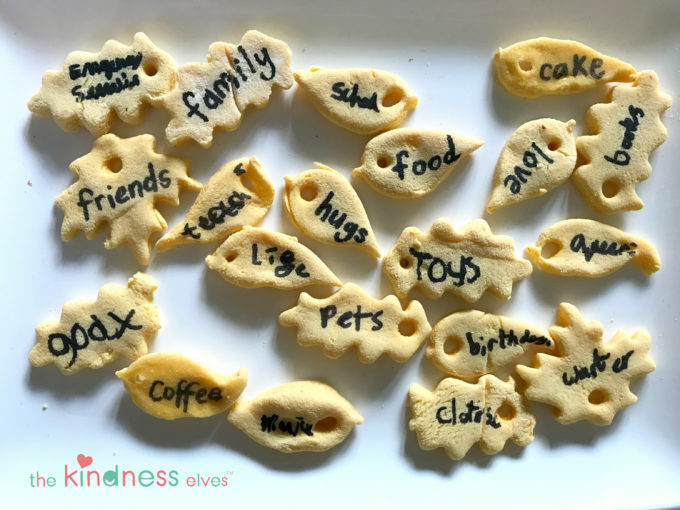 This activity is so simple to do and makes a lovely family activity to be done at Thanksgiving or any time. Mix the dry ingredients together then slowly add the warm water, stirring as you go. After mixing it well, take it out of the bowl and start to knead it on a lightly floured surface until it's soft, pliable and completely non-sticky. As with any dough, you can adjust slight problems by adding a little more flour if it's too sticky and a little more water if too crumbly. Roll the dough on a lightly floured surface until it's about 1-2 cm thick. Then use leaf shaped cookie cutters to make the leaf shapes. Put these straight onto a baking sheet and then use a straw to make a hole in each one, ready for stringing a ribbon through after they've dried. Put the baking tray in the oven on a very low heat, approximately 100 degrees C (around 210 F.) Leave it for 2-3 hours. If it's still doughy in the middle then flip them over and eave for another hour or so. They should be hardened through and it may be a sign that they're too thick if not. Once they've cooled they're ready to write on! We each chose a few things that we are really thankful for and wrote just one word on each leaf to represent those things. The kids thought of friends, family, school, teachers, food, water, toys, God, Mummy, pets and birthdays, to name a few! It was a lovely opportunity to talk about the things that are really important in our lives that we simply couldn't be without, and those things that are just extras. We talked about the sad fact that many children around the world are not as fortunate as us and ways to show support to them too. 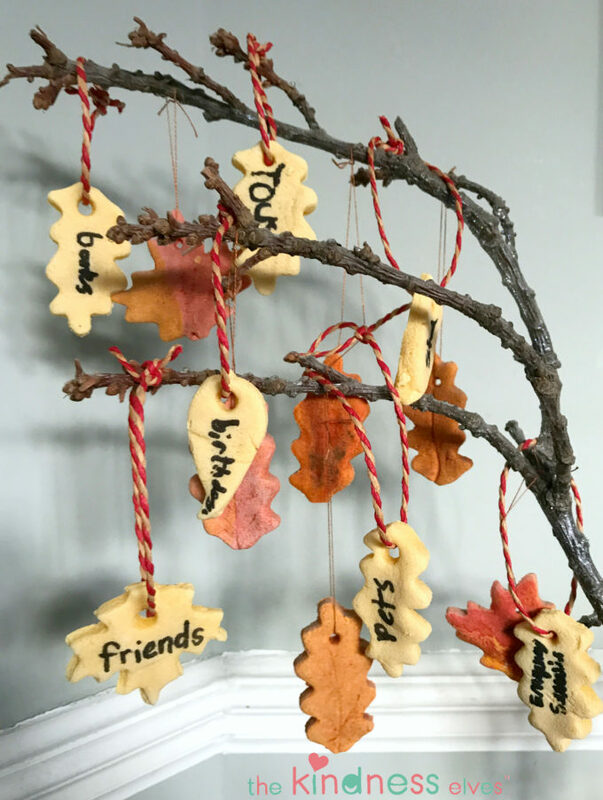 Once they were finished we threaded some twine through each hole, tied them off in a loop and then hung them on our tree branch to make our own tree of thankfulness! You too can display the results on a branch in your home or classroom and use it as a starting point for discussions. It could be good to ask visitors to take a look at it and add their own things that they're thankful for too! You could leave some blank ready to be written on especially for this purpose. The Kindness Elves would love to know what you would write on your leaves! Can you tag us in any pictures of your kids doing this activity? We would really love to see them! Use hashtag #thekindnesselves and #kindkids on Instagram and Twitter, or post directly to our Facebook page so we can find them. Would you like more ideas like this? Leave your email below and we'll send you more! Also...we have a gorgeous Autumn Acts of Kindness Poster for you to download, print out and display at home for free! Find your copy here. Sign up for more ideas!